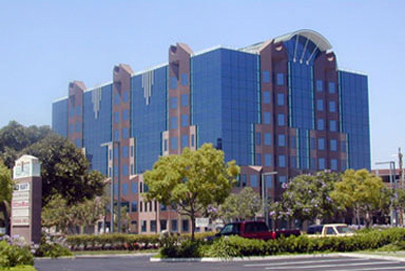 The Cerritos Towne Center was part of a planned development in the City of Cerritos by Transpacific Development. The completed development includes over 500,000 square feet of office space in seven buildings, including restaurants, shopping, hotels and a performing arts center. The development has transformed the downtown area of Cerritos into a center for business and entertainment. The low vacancy rate of office space in the development has confirmed that the additional space was needed. The completed design by Archisystems International provided a very original look that pulled shapes and elements from the art deco period. The key components in this design were the saw tooth areas of stone in contrast to the very clean lines of the glass. The use of two finishes on the stone gives the appearance of two different stone types. The large sloped and radiused crowns complete the stone at the roof. The structure consists of 165,000 square feet of office space and elevator lobbies. The lease space was speculative and the company’s leasing space would complete the actual office space build out. The first floor lobby is two stories tall and includes stone and wood finishes. The final stone design included 30,000 square feet of mechanically anchored veneer stone over metal stud walls that were built in place. A secondary water/vapor barrier was installed over the metal studs prior to the stone installation. Embeds to support the framing were fabricated and supplied to the contractor for placement prior to pouring each floor. The granite “Carmen Red” was fabricated and shipped from Spain, however it was purchased by the glazing subcontractor whom CSI was contracted by for the design and installation of the stone. This project provided very distinct challenges in not only the saw tooth and crown design and installation, but the additional level of communication that was required being a third tier subcontractor. The waterproofing and secondary control of any vapor or moisture that may develop in the cavity space were of great importance in the design of the building and were scrutinized for accurate and proper installation throughout the project. In addition the interface with punched opening and curtain wall glazing required a great deal of care and attention to layout and installation of the stone. This entry was posted in Handset on October 1, 2014 .